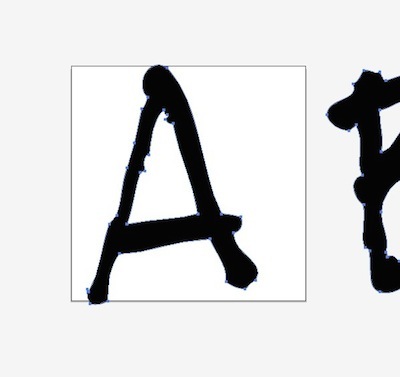 The answer is “of course!” But even better, you can create a font out of your handwriting! 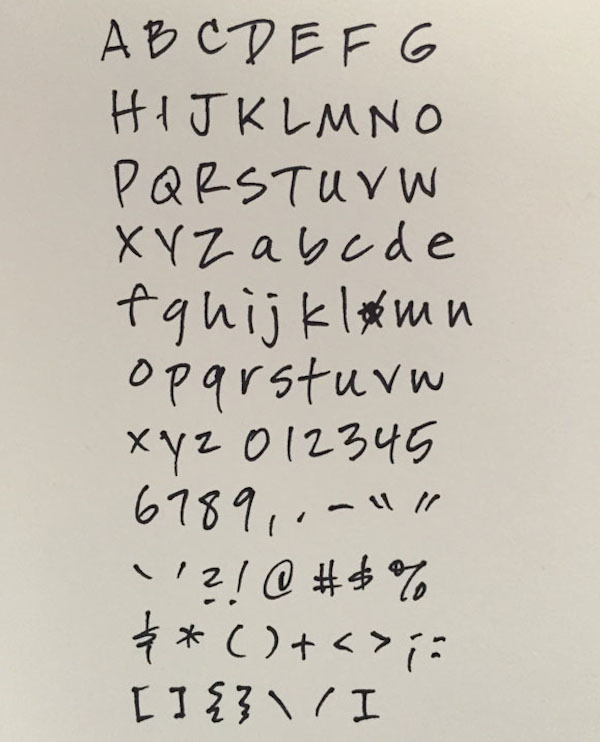 It’s actually not too hard to get a basic font up and running using your smartphone camera, Adobe Illustrator, and Glyphs Mini, a low-cost but remarkably powerful little font editing app. You can buy a license for Glyphs mini from the Apple App Store or the Glyphs site for $49, or try it free for 30 days. Trust me: Typing out words in a font you’ve created is a thrill. 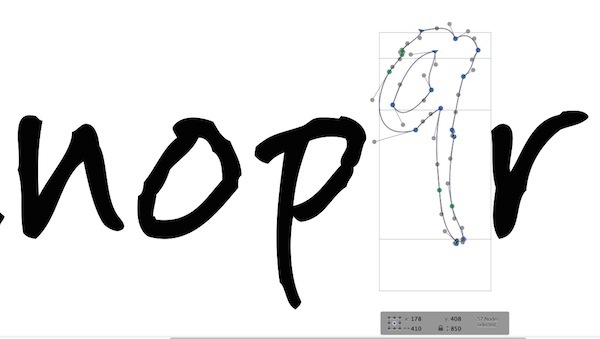 So let me show you how to make a handwriting font. 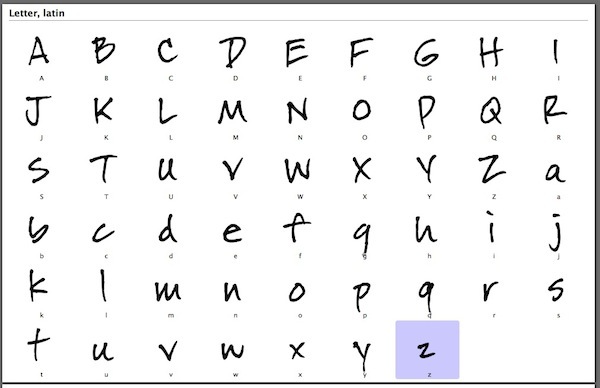 Write out the letters of the alphabet in upper and lower case, plus numbers and punctuation. (Use the computer keyboard as a guide.) Group the letters in a shape roughly the same proportions as your cell phone camera. Take a picture of the sample in bright but indirect light, making sure the phone is level, and the bottoms of the letters are as horizontal as possible (not rotated in the photo frame). Transfer the photo to your desktop computer. Open Illustrator and create a new file (command-N) with dimensions of 700px x 700x (9.72″ x 9.72″). Choose File > Place and select the photo. 3. 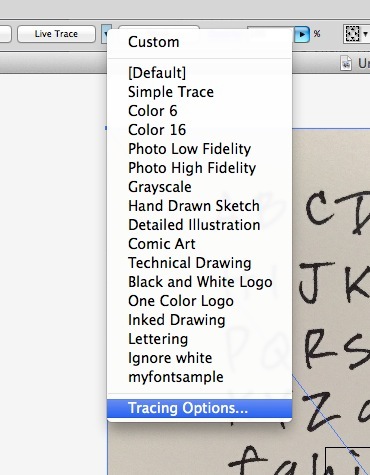 With the image still selected, choose the dropdown arrow to the right of the Live trace button, and select Tracing options. 4. Check the Ignore White box, the Preview box, and if necessary, slide the Threshold slider to the left or right until the letter strokes look solid but the holes in the letters are still wide open. It will take a few seconds to re-process each time you move the slider, so be patient. When it looks good, click Trace. 6. Select all (command-A) and move the block of characters so that the bottom corner of the uppercase “A” is near the bottom left corner of the document bounds. 7. Select the scale tool and click on the bottom left corner of the document bounds. Then click up and to the right of the “A” and drag up and to the right until the “A” roughly fills the document bounds. 8. Select the “A” and Copy (command-C). Open Glyphs Mini and create a new font (command-N). Choose File > Font Info (command-I) and choose a name for your font. Save! Double-click the A character box to open it. 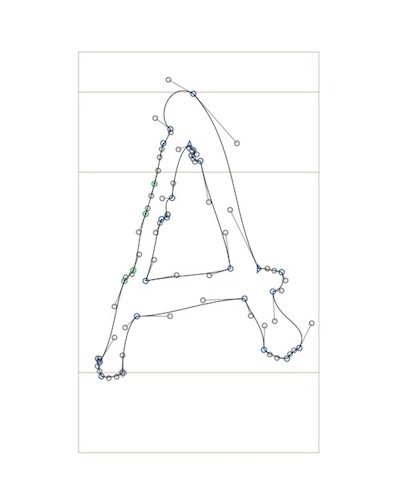 Paste the “A” you copied from Illustrator (command-V). It should fit perfectly within the window. As a basic starting point, give each character 50 points of space on the right. Click anywhere in the white space around the character to deselect the points. Then in the gray box below the character, double-click the “R” value. Type “50″ and hit the enter key. 7. Return to Glyphs, hit the “end” key to move to the next character window, and paste. 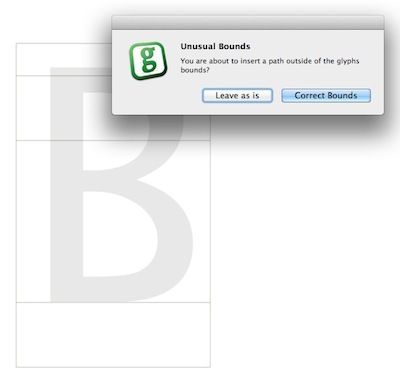 Glyphs will display an “Unusual bounds” dialogue box; click “Correct bounds” (or hit the enter key). The B will appear in the window, aligned with the left edge (aka “sidebearing”) of the character boundary. Set the “R” value to 50, the same as you did for the letter A. 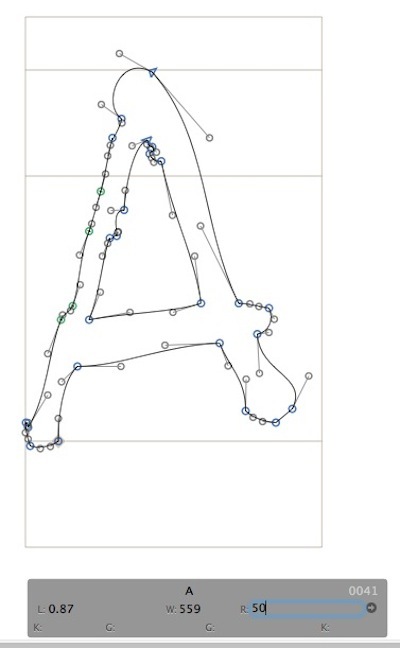 8. Letters with particularly long ascenders or descenders (b, d, g, p, and q) may come into Glyphs too high or too low. Double-click on the letter, select all points (command-A), then grab the letter and move it up or down. Hold down shift while moving the letter to keep it vertically aligned. 9. Continue this process for the rest of the upper and lowercase characters. 10. 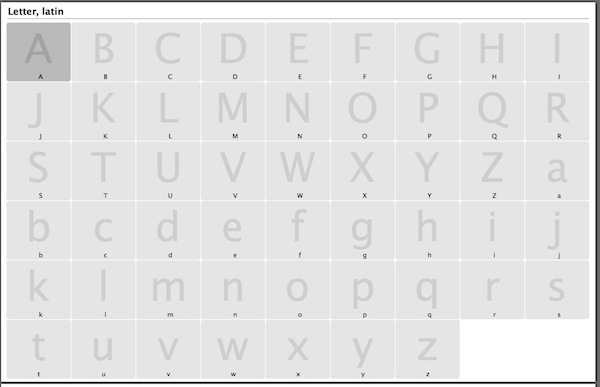 You can view a group of letters at once by choosing the Text tool (t) and typing the characters you want to display. Double-click any of them to edit, or paste in a new character from Illustrator. In the font tab, select all (command-A). Choose File > Export, choose the destination and click Next. Install the font in your system by double-clicking the font file and clicking Install font. Open any application, choose your font from the font menu, and start typing! If you want to take your font to the next level, then add in numbers and punctuation! You might also go in and clean up the ends and edges of your letter shapes—the points and handles work a lot like Illustrator’s. And if you want to get really fancy, kern the “problem” letter pairs like FA PA TA, etc. For help using Glyphs, watch the Glyphs Mini overview on lynda.com. 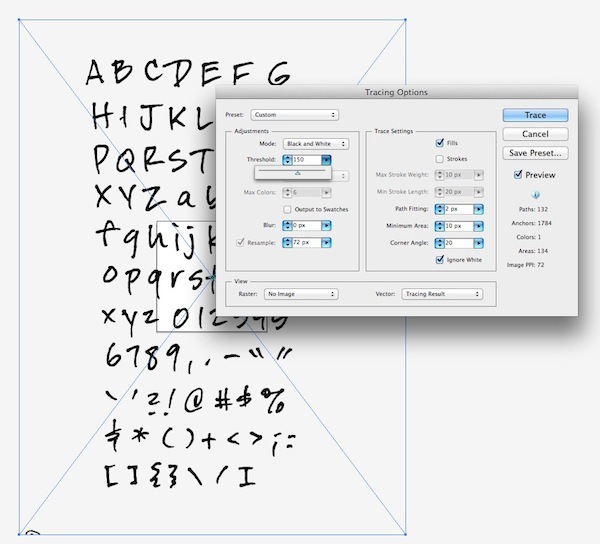 To learn more about creating a custom font, watch Chapter 10 of this course by Deke McClelland.